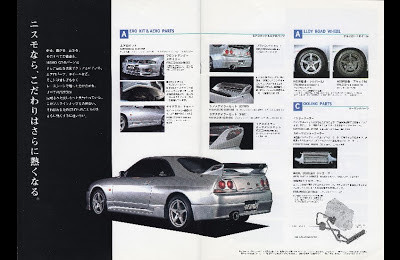 As Peter LeFeuve, a fan on the R33 GT-R Facebook page reminded me, I was delinquent in posting this particular R33 GT-R catalog... so here it is! Check out the "Front Under Spoiler" at top. Did you know that the center intake portion was designed to accommodate the Nismo Oil Cooler (see next page)? The dual blade rear spoiler came in two flavors - either carbon fiber, or fiberglass. 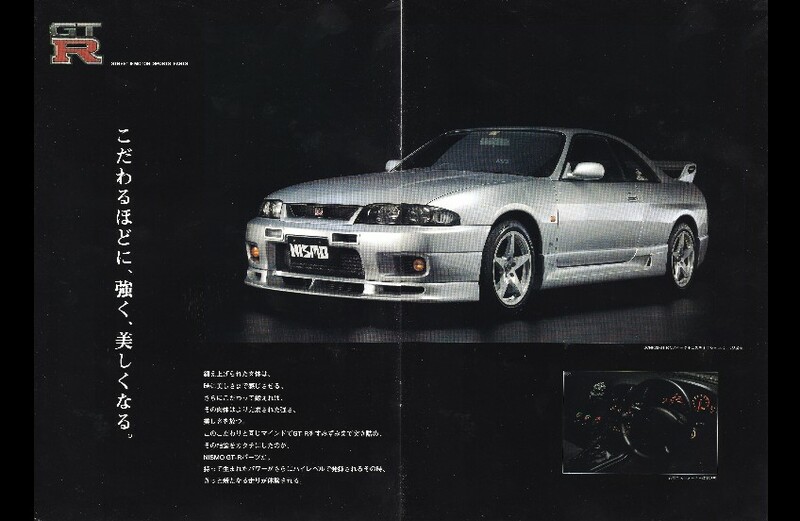 Check out the pricing on the intercoolers - the standard intercooler was 288,000 yen, while the "sports intercooler" was 348,000 yen! I guess some things haven't changed (Nismo is always expensive). 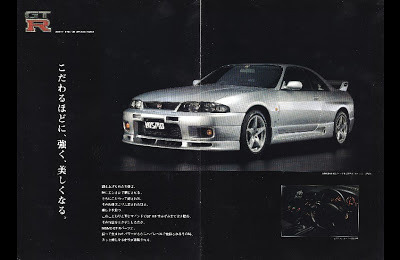 Of interest is the radiator with built in water-cooled oil cooler (yours for only 320,000 yen), while the stand-alone "Nismo oil cooler" has a separate water tank in order to increase engine oil cooling capacity (105,000 yen). Likewise, how many people knew that the strut tower bar came in two versions - anodized aluminum, and titanium? And only 69,800 yen for the titanium piece! The aluminum/carbon shift knob, is also now highly sought after as a used part, I've never seen it for this price on the auction sites. Yes, the brake cylinder stopper is cool.. would love to have one. But I'm really curious about the Motor Sports Parts - they have Group A spec (158,000 yen each) and LeMans race spec (210,000 yen each) turbos, as well radiators for N1 racing. Most interesting is the offering of a front differential oil cooler (260,000 yen) however. Note - products with an "RR" in the product code are race spec only, and are not covered under warranty and illegal to use on Japanese roads!